As a warm up this morning, I redrew and redesigned some characters I created for a children’s book that has (thus far) been given the thumbs down. In hindsight, the book doesn’t have the best story, but someday it may get revived and or reworked. 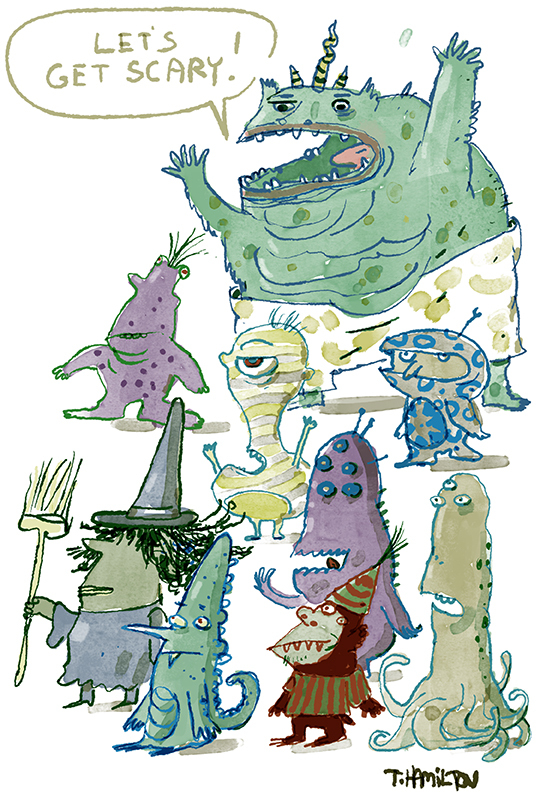 No, the book was NOT going to be called “Let’s Get Scary.” I know that’s the territory of the movie Monsters Inc. This book Idea was going to be about a monster called Wall-E. 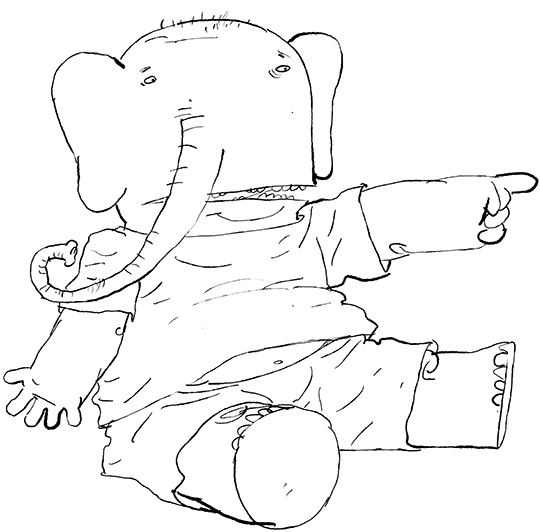 Ink lines and the elephant in the children’s book. We took a quick trip out of town for Easter/Spring Break/ Passover/Fertility festivals or whatever one celebrates at this time of the year. Although I did relax, I spent most of the time thinking about what kind of ink line I wanted to use on the children’s book I’m working on. Unfortunately, these are the kinds of demons that haunt my days off. It’s always in the back of my mind. I look at the last book I did and wonder how I drew such boring lines. Will the publisher notice and pulp them all? Lately I’m testing out ink brushes using a Cintiq, which is always a battle against the perfect. In my experience, I can tell you that the best line I ever created was by breaking a chop stick in half and inking with that splintered piece of imperfect wood. In the process you inevitably stab yourself and inflict inky splinters. This small amount of pain and suffering is what I think actually convinces me that the drawing is perfect and worthy of not going into the trashcan. The positive effects of self-inflicted pain could, and have, made up entire blog posts (and books, and movies, and songs) so I won’t go into that here in my brief paragraph. Rather, I’ve posted a sketch here from my next book. After drawing the book three times or so, I finally like the line work I did on this elephant. And I didn’t even hurt myself. That’s what I call my life size Archie Costume. Get it? Get it? Actually I’m in my home in front of the computer finishing up this children’s book. 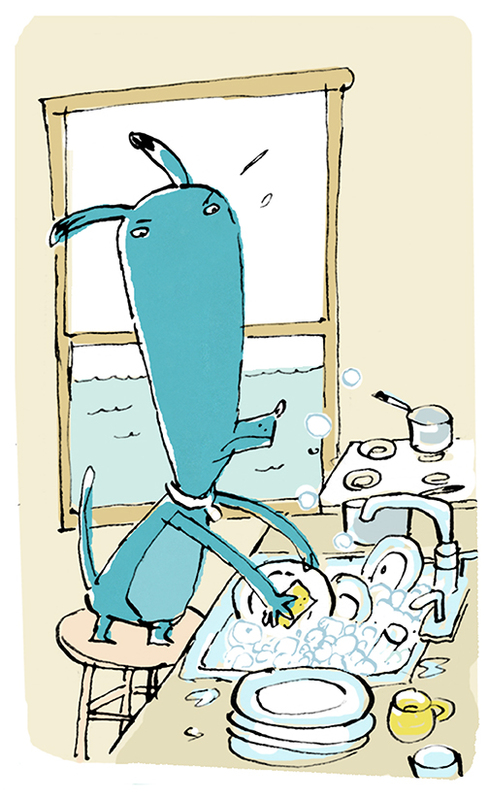 A dog doing the dishes??! Yes, it’s insane. 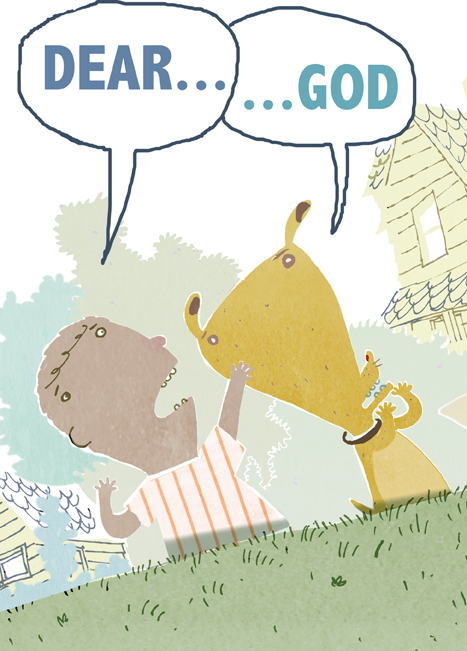 In the midst of writing, re-writing and re-drawing art for a children’s book, many things can go haywire. The kind of haywire that haunts you as you as you try to sleep while it’s 80 degrees and humid. 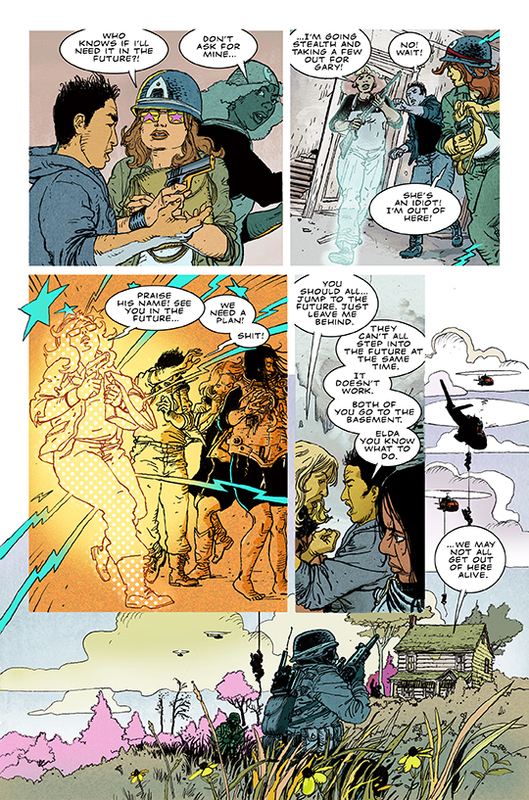 Through no fault of my editors, and certainly no fault on my end, I drew a page that was incorrect on so many levels that I may have to build a funeral pyre to burn it on. But before that happens, I present it to you below. Of course, the page that will ultimately appear in the final book will have different characters and take the plot in a shockingly different direction! Actually, I may be exaggerating a bit. The new art will simply leave room for the copy write. 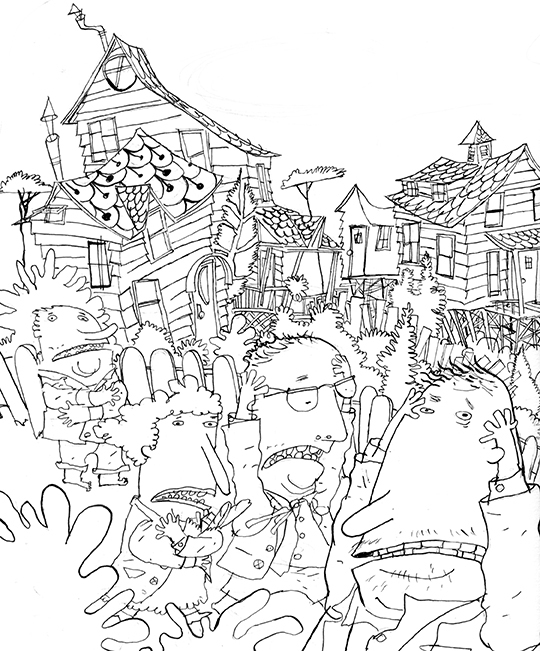 So I’m illustrating this book I wrote.